Brittle nails are so frustrating! You try to grow out your nails so they look nice, and just when they reach the length you want, one either snags and rips or breaks for no apparent reason. Can you do something to encourage strong, healthy nails? Take heart. 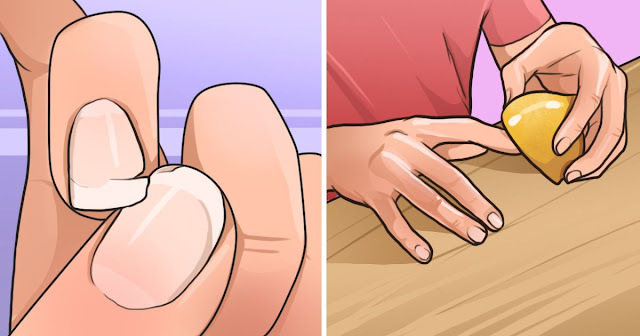 Although you may be prone to brittle nails because they run in your family or because you fight with health issues that cause nail problems, you can still do things to protect your nails, encouraging stronger growth. Check out the 5 easy things you can do to put an end to the tyranny of brittle nails. 1. Vitamin E oil. Podiatrist Carolyn Siegal recommends rubbing vitamin E oil into your nails and cuticles one to two times a day. Definitely using it at bedtime is a plus as the oil can soak into your nails without being washed off soon. 2. Cuticle cream. Since the nail grows from your cuticle, WebMD states that keeping your cuticle nourished, healthy and moisturized is important for healthy nails. Applying cuticle cream at night gives your cuticle and nails a fighting chance. Coconut oil is extremely moisturizing, so Coconut Oil Central walks you through making your own cuticle cream by combining 1/4 cup coconut oil and 1 teaspoon beeswax. Heat the coconut oil in a pan until it melts. Grate the beeswax and add it to the melted oil. Stir it until the wax melts. Remove the mixture from the heat and transfer it to a bowl. Whip it with a mixer until it reaches your desired consistency. Pour the cream into tins and store for use. 3. Nail polish. Surprisingly, WebMD shares a piece of advice that women love to hear! Nail polish is actually good for your nails. Cold temperatures and putting your hands in and out of water draws moisture out of your nails. Nail polish actually helps trap the moisture in your nails. A word of caution is advised, though. Don't use nail polish remover more than once a week, and never pick the nail polish off as you will remove a layer of your nail, which is bad. 4. Gloves. Dr. Oz gives a number of tips for taking care of your nails. Wearing gloves when you wash dishes or do anything that is going to keep your nails and hands wet will help protect your nails and cuticles. You can also wear gloves at night after putting on a rich moisturizing lotion or cream locking in the moisturizer. 5. Sanitizers. Alcohol, although it kills germs, also dries out the skin, nails and cuticles. Dr. Oz says to use an alcohol-free sanitizer to protect your hands when you can't wash them. Dr. Rosen of MindBodyGreen recommends making your own hand sanitizer by combining in a 4-ounce spray bottle 1 tablespoon of aloe vera gel, 10 drops of cinnamon essential oils, 20 drops of orange essential oils and 3 ounces of water. Mix the ingredients well and then spray the sanitizer on your hands as needed. 6. Orange wood. WebMD recommends using orange wood cuticle sticks to help push the cuticle back on the nail. Make sure the cuticle is softened first. Cutting the cuticle can open your nail up to an infection. Taking care of your hands isn't just vanity; it's good for your body as a whole. By adding some extra moisturizer to your hands and nails, you may be able to get nails far stronger than you thought possible.